• Free Real-Time Traffic Updates for Life. • Zagat® Ratings and Reviews. I presume this is just for the US market? 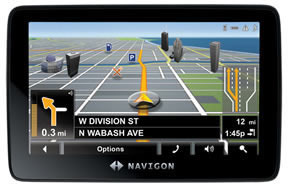 The NAVIGON 7200T will sell for $449 (MSRP) in the U.S. and Canada when it hits stores shelves and online retailers in October 2008. The Press release was sent to us by Navigon USA. It is noticeable that the IFA Expo is on in Berlin later this week and Navigon have a press conference scheduled for Friday. I imagine if anything is going to be announced for Europe it will be then. The 7210 is already on the European website under the IFA section. Say's should be available in Europe Sept time... still wondering what the 'secret' is going to be. A lot of this sounds awfully familiar...... how often and when do we get map updates, and is there provision for something akin to "map-share"? We have the Navigon software in our X-Trail and I have to say it is very good and the lane assistant is very handy indeed. I wish Nissan had seen fit to include postcode search in the software version in the car but it has made me wish I could have the Navigon with mapsource to allow route planning so if they can include that it would be brilliant. Linked to Autocom by bluetooth and all seems good. That is difficult to say until we get to test it. Navigon software is notoriously slow, but that has been improving recently. Navigon were first to market with the lane assist and reality view for junctions both of which are creeping into other software packages. Which one Garmin or Tom Tom? Not really had any recent experience with Tom Tom. My friend had the original Rider which I thought was quite good untill I researched sat nav for myself and decided on a Garmin, nothing has changed my opinion since then and from what I read TT's backup is non existent. On the other hand Garmin have been very good with problems I have had, and tried to help where they could. Now we have the X-Trail there are some very good features which I wish my Zumo had. It gives far better directions when you enter busy junctions with lots of changes close together and as I said the Lane Assist is fantastic and very useful when you don't know where you are going (have not tried in Edinburgh which could be interesting). The traffic info is better on the X-Trail and gives more information. It has made me consider a Navigon system for my car but I have not considered a TT. Now if only they had an equivalent to Mapsource and I would convert very quickly. 349 Euro's according to the IFA section of Navigon website. Almost bought a 2110max but might wait a bit longer for this! Oh hold on you can't use the Camera database from here. I wonder if the Mapfresh feature includes cameras (mobile and fixed). Any Mods on here know if it will be included anytime soon. Could be worth waiting on.... not sure if the 7210 will include the map updates in the price like the 8110, but the unit itself has extra features over the 2110max... also don't forget the 2150max which adds bluetooth. In response to other questions in the thread, I have found the 8110 (based on the v7 software) very fast and in an recent T3 review it consistently plotted routes quicker than the TomTom. I have posted a few videos on my site which show the 8110 in use and I can't see the 7210 software being too different.